Tonight should be the last we see of MasterChef for nine months. TEN has confirmed there will only be one series of the show next year, ditching all spin-offs involving professionals, all-stars, celebrities and kids. 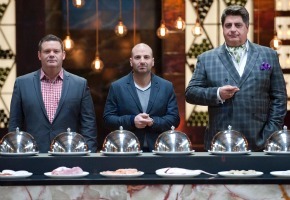 “There has been a lot of MasterChef on in the past couple of years so really what this show needs is a break,” TEN program chief Beverly McGarvey told News Corp.
“It is definitely our intention to rebuild the brand – to grow the numbers next year. We think it is still a great show. We like what it represents. It is about dream fulfilment. Good decision. We’ve had far too much of the show in recent years and this dilutes the brand. Tonight Emma Dean, Samira El Khafir and Lynton Tapp will compete for the 2013 title. The above figures are all for 5 city Metro, “The Winner Announced” segment. Everyone talks about MC’s poor figures here in Australia but it is seen around the world on pay TV & has a huge audience in Asia where they have even shown the 2 Junior MC series. Because of this it is still making a lot of money. I think that there is a lot left in the brand in Australia too. I hope they go back the original format. .. Sundays was mystery box and invention test. .. Only one team competition each week. .. strong focus on cooking. It was too much like mkr this year. The celebrity version really killed the brand. Junior Masterchef and Masterchef Professionals weren’t bad, but they were unnecessary. I love the show but think this is absolutely the right decision. That’s too bad. I would have liked to have seen another series of Celebrity Masterchef, but as long as they bring back The Biggest Loser in 2014, I don’t care. I didn’t watch Professionals, so MCA hasn’t been over saturated for me, but I can see where they are coming from. A good decision. A 2nd celebrity edition over summer would be fun though to fill in the gaps, but I guess not during non-ratings. Too little too late in my view. Ten should have realised this earlier. They have done irreversible damage to the Masterchef franchise and it will never recover. It is dying a premature death because of the lunacy of Channel Ten programmers. I think it all started to go wrong after Shine took over last year. The quality of the contestants and their ability to cook went down to MKR levels but without the contrived drama. I gave up on this series until Heston came round these final weeks. I can’t believe they’re making rookie mistakes so close to the end! Had Ten not oversaturated the brand, MasterChef would today be delivering stronger numbers to Ten in their time of need. I think it will be difficult to rebuild the numbers. The damage has been done by oversaturation, and the reality market is now well catered for by Seven and Nine. Time for Ten to move on. Good news, but, what on earth will they find to fill the amount of time it used up? I may be proven wrong, but I can’t see MCA recovering. Nine months time is June 2014, so it will still be up against the Block at the start & X Factor, AGT at the finish. I don’t think the audience is tired, I think the format this ear was very poor, as were the cooking skills of the contestants. Beverly should first remove the plank from her own eye before worrying about the splinter in the audience’s. I just don’t know if MC has any life left in it at all. I was a diehard fan and thought I would watch forever but this season I’ve become so disinterested and can’t think what would make me watch next season. I also don’t know a single person who watches it anymore, as opposed to in previous seasons when my whole family and a lot of friends watched so we’d often be texting through the shows and talking about MC when we saw each other. For me, the ‘water cooler’ discussions of reality shows has always made it a lot more fun and helped me stay interested. A good decision, but 3 years too late, the damage has been done, they should have made this decision after the first season of JMC bombed. that was the turning point where people started tuning out. 9 months isn’t enough, it needs to take a full year off, like AGT and DWTS. Masterchef 5 delivered a “straight from casting central” group of contestants with very low credibility this year. Some really bad cooks and the opening credits ending with Lynton placing his hat at the head of the table was bilious. I thought the judges were outstanding this year in their presentation ,mentoring and decision making .Shame about the cardboard cutout contestants. Good idea, and they need to get back to what made is successful in earlier seasons. This year was a shambles, most of the contestants wouldn’t even have made top 50 in previous seasons. This is the first year I’ve barely watched, and I don’t even know who is in the finals. This season was just cringeworthy with bad casting, they all seemed so loud and obnoxious and annoying. The brand has definitely been over saturated. I do wish they’d do another Junior Masterchef though, but Masterchef Professionals etc can go! Bring on My Kitchen Rules, bogan or not, I love it!